Aim Using new perfusion software for evaluation of the success of percutaneous treatments of malignant liver tumors with CEUS. Materials and Methods Retrospective analysis of 88 patients (74 male, 14 female; 30 – 84 years) with 165 malignant liver lesions. The lesions were 57 metastases and 108 HCCs. The success of interventional treatment (IRE n = 47; RFA n = 38; MWA n = 44; TACE n = 36) was evaluated by CEUS and perfusion software (VueBox®). CEUS was performed after injection of 1 – 2.4 ml of sulfur hexafluoride microbubbles (SonoVue®) using a 1 – 5 MHz convex probe. DICOM loops up to 1 min. in the ablation area were stored digitally in the PACS. Regions of interest (ROI) were manually placed in the center, the margins of the lesions as well as in the surrounding tissue. Using VueBox® peak, time to peak (TTP), mean transit time (mTT), rise time (RT), the wash-in and wash-out rate were calculated for the regions, in order to evaluate the success of the percutaneous treatment after the ablation in comparison to the ceCT/ceMRI up to 6 months after the treatment. Results There were significant differences in all cases between the center compared to the margins for the main perfusion parameters (peak, mTT, RT) (p < 0.001). Peak, wash-in and wash-out ratios were further analyzed with the type of lesion and the method of ablation. All parameters were significantly different between lesions treated successfully vs. lesions with recurrence. Conclusion A combination of CEUS with perfusion imaging enables critical assessment of successful treatment after percutaneous interventional procedures for a malignant liver lesion. 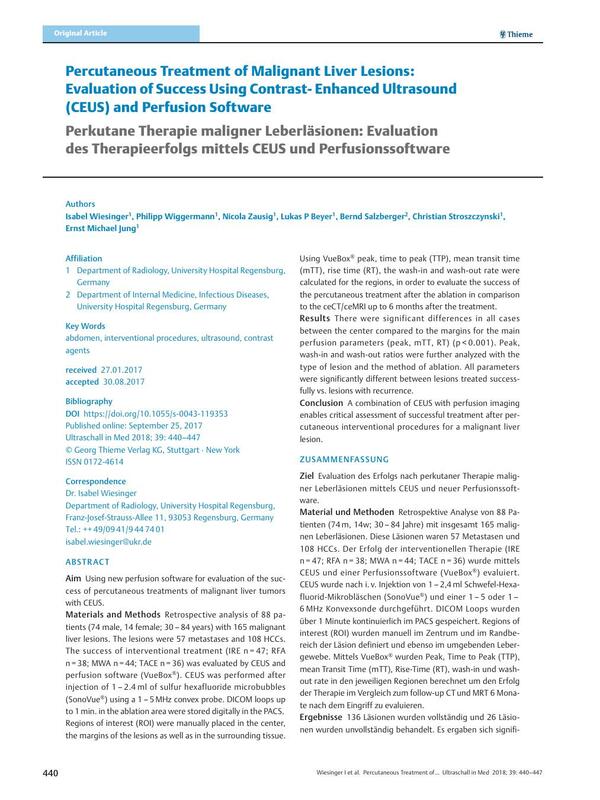 Ziel Evaluation des Erfolgs nach perkutaner Therapie maligner Leberläsionen mittels CEUS und neuer Perfusionssoftware. Material und Methoden Retrospektive Analyse von 88 Patienten (74 m, 14w; 30 – 84 Jahre) mit insgesamt 165 malignen Leberläsionen. Diese Läsionen waren 57 Metastasen und 108 HCCs. Der Erfolg der interventionellen Therapie (IRE n = 47; RFA n = 38; MWA n = 44; TACE n = 36) wurde mittels CEUS und einer Perfusionssoftware (VueBox®) evaluiert. CEUS wurde nach i. v. Injektion von 1 – 2,4 ml Schwefel-Hexafluorid-Mikrobläschen (SonoVue®) und einer 1 – 5 oder 1 – 6 MHz Konvexsonde durchgeführt. DICOM Loops wurden über 1 Minute kontinuierlich im PACS gespeichert. Regions of interest (ROI) wurden manuell im Zentrum und im Randbereich der Läsion definiert und ebenso im umgebenden Lebergewebe. Mittels VueBox® wurden Peak, Time to Peak (TTP), mean Transit Time (mTT), Rise-Time (RT), wash-in und wash-out rate in den jeweiligen Regionen berechnet um den Erfolg der Therapie im Vergleich zum follow-up CT und MRT 6 Monate nach dem Eingriff zu evaluieren. Ergebnisse 136 Läsionen wurden vollständig und 26 Läsionen wurden unvollständig behandelt. Es ergaben sich signifikante Unterschiede zwischen dem Zentrum im Vergleich zu den Rändern für die Hauptperfusionsparameter (Peak, mTT, RT) (p < 0,001). Peak, wash-in und wash-out wurden anschließend noch in Bezug auf den Typ der Läsion und die Ablationsmethode analysiert. Zusammenfassung Eine Kombination auf CEUS mit Perfusionsbildgebung ermöglicht eine kritische Analyse des Erfolgs der Therapie nach perkutaner interventioneller Behandlung bei malignen Leberläsionen.